Manchester's Town Hall is one of the finest buildings in the country and it was chosen as the inspiration for this piece of music. It was built in the neo-Gothic style in 1887 and is 286 feet high and was designed by Alfred Waterhouse, a leading architect of the time. 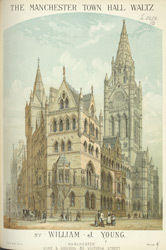 Manchester had received 'city' status in 1853 and the Town Hall was a sign of it's success. This illustration is very detailed, and great care has been taken, even down to the inclusion of the people outside the town hall. A little girl carrying a basket can be seen in the foreground.